Gain Sense: What's with all the iOS7 and Apple criticism? I do agree with Doud on one point, and that is that hardware (i.e. processor speed, megapixels, etc) is not truly what matters at this point. As I stated in a previous article, smartphones haven't really noticeably improved in that department in terms of real world usage. Today, what matters is software. Doud criticized Apple's iOS by describing it as "fully integrated boredom," which is a vast overstatement in my mind. It's true that it hasn't changed much in the last few years, but as an owner of a Nexus 7 and an iPhone 4S I can say that in terms of functionality I really have no problems with it. It is true that Android 4.2 on my Nexus 7 allows me to do more with widgets and folders and homepages. 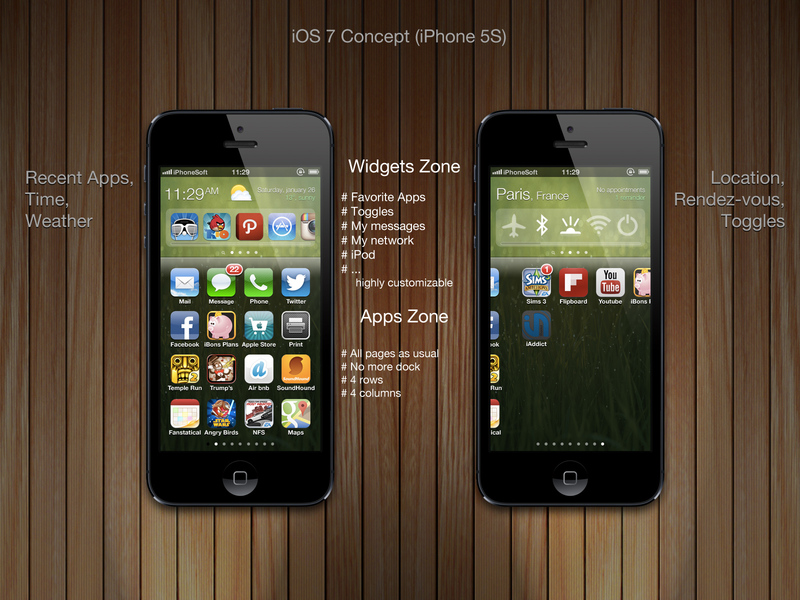 It also gives me live wallpapers, a better multi-tasking system, and more overall advanced customization options. Even so, my iPhone runs smoother despite inferior hardware (I believe the Tegra 3 is more powerful than the A5), and while it lacks customization it provides an incredibly simplistic and intuitive mobile experience that rarely makes me feel like I want more when I am using it on the go. Additionally, I get a smoother browsing experience through safari than I do through chrome on my Nexus 7, and I attribute that to the streamlined nature of iOS. Is it perfect? No. Does it get the job done? Yes. Why should it matter if it is boring then? Why should we be lauding the "half-baked innovation" in Samsung phones if they don't really bring anything to the table besides gimmicks and rarely used features? As someone who has owned a Nexus 7, Galaxy S, and iPhone 4S, I do not understand all of the hatred some of these tech writers have for iOS. iOS came under fire once more in an article by pocketnow's Taylor Martin. While reading, I noticed a major flaw in Martin's overall argument right off the bat. He began his article by, and I paraphrase, stating that iOS has gone through minimal changes over the past six years. He then implies that Android is better because it has gone through far more change, as exemplified by the shift from Eclair to Froyo to Ice Cream Sandwich to Jelly Bean to Key Lime Pie. Unfortunatley for Martin, that is an incredibly lame and easily countered argument. As a former owner of the Galaxy S, I can say that Eclair and Froyo were terrible operating systems compared to iOS. Gingerbread was OK, but knowing someone with a Droid X2 I can say that it was still nowhere near iOS. Ice Cream Sandwich got closer to overtaking Apple, and with Jelly Bean I think that Android finally became optimized and customizable enough to have a proper fighting chance against iOS, even beating it in a few key areas. The main point I am trying to get across here for Mr. Martin is this: does frequent radical change to an operating system's UI mean that it is more innovative? No, it really doesn't. Like I said, Android 2.1, 2.2, and 2.3 were terrible laggy messes. Just because there were many changes between the three doesn't mean that Google was more innovative than Apple, they were just trying desperately to find a way to compete with iOS. Apple didn't need to make many changes because their OS already did exactly what they needed it to do at that time. Android 4.0 was another massive UI change, while 4.1 added optimizations that finally brought Android to a level near that of iOS in terms of reliability. To close on this point, Mr. Martin's claim that innovation stems from massive UI overhauls is not well thought out and fails to consider that the reason for these overhauls was because Google was playing catch up, not trying to innovate. In fact, Google was doing the same thing pocketnow is lambasting Apple for with iOS7: adding features so as to have a better chance against their competition. In the end, I am unsure if what I've pointed out could convince the writers of pocketnow of the presence of gaping holes in their arguments. This is especially true of Martin, who closed his article by stating that even if Apple incorporates "major improvements to iOS," it would all be for nothing without a massive overhaul of its UI. I guess this shouldn't be surprising coming from a guy who defends an Android OS that for years relied on overhauling its UI instead of optimizing its performance. It will be interesting to see how these writers react to the release of iOS7, which looks to keep the streamlined and optimized nature of iOS while adding some of the features present in Android 4.1 that I and most people have come to love. Based on what they've written, I don't know if it really matters because they will probably just judge iOS based on its looks (which is highly subjective anyways) and not its functionality or usability. I'm late to commenting on your finely written post. I would like to point out a few things however. Android changed things with notifications, Google Now, and few fairly significant contributions that allude me at the time of this writing. But your article is pretty damn spot on. As we know, there is nothing gimmicky about Apple. They have amazing integrity in their philosophy, and designs, although at the time of this writing a year later, I think it's pretty clear that they have been taking some things from Android, but as usual they do it better. It's more polished, always less buggy and simply more reliable. Just to reinstate it, I agree with the meat of your argument. Bravo.